So you want some Sims 3 downloads. They're not that difficult to find. Here's a guide to finding Sims 3 custom content, especially clothing, makeup and accessories. When EA Games released the Sims 3, they announced that custom content would be impossible to add to the game. All custom content would have to be bought through the Sims 3 official store. After a brief moment of anger, the sims community laughed in derision and prepared to make custom content in spite of EA's pronouncements. 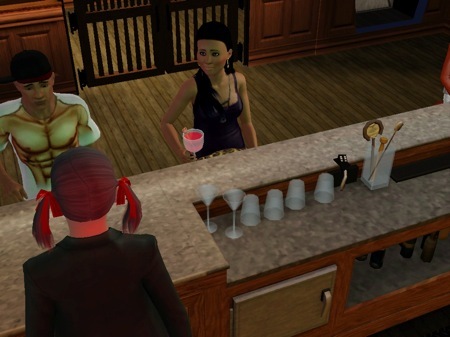 Of course, it's not illegal to upload third-party content in the Sims 3. It's just difficult, in the loosest sense of that word. The below tutorials will show you how to upload custom content into the Sims 3 no matter what your system or your expansion packs. The Sims Wiki's CC tutorial is a good place to start. You'll need to check to see if your edition of the Sims 3 is patched to the latest level, which Sims Wiki strongly recommends. If it's patched to 1.12.70 or above, check this tutorial for more help. Sims 3 Gamer has a simple, one-page tutorial. Mac OS X Video Tutorial by unsecretcrush. Windows Video Tutorial by McWolf108. Almost Every Sims 3 Tutorial from SimPrograms. All About Style has clothing galore, for seniors, adults and teens. Preponderance of women's and girl's clothing, as on most custom content sites. Lorandia Sims 3 is a women's fashion boutique, with an emphasis on formal and high-end fashion. Mod The Sims is a large forum/community site, with many mods in every conceivable category. Parsimonious has fashion and housing choices for all three Sims games. PeggyZone has free and paid downloads for the Sims 2 and 3. Lots of women's hairstyles. Rose Sims has excellent hairstyles, clothing and accessories for female sims. In English and Chinese. Shymoo is a good Sims 2/3 Fashion website. In Spanish and English. Sims 3 Boutique has free women's clothing, patterns and sims available for download. The Sims Resource has any and every kind of custom content, uploaded by many different users. You must subscribe (pay) to be a member, but it's worth it for the die-hard sim addict. For a full list, see this website.